At the beginning of July, an unknown drone caused chaos at Gatwick airport in London. According to the statistics data, five flights were diverted. More than thousands of passengers suffered because their trips were disrupted. This drone was flying too close to the runway at Gatwick. These days more and more people buy drones. Yet still, not all of them follow the drone rules and regulations. Such incidents can really cause a catastrophic crash. In this review, we will discern about the main concerns of pilots and airlines. Besides, we will find out what to do to avoid such issues. What can a drone do to the aircraft? For instance, if (because of some reasons) the drone strikes with the aircraft wing, the plane will not suffer. Nevertheless, if a drone is ingested by an engine, this may cause an air disaster. The situations when birds are ingested by an engine happen frequently. Yet still, the airplane can fly with only one engine. If it is a drone, this may lead to the plane crash because a quadcopter is endowed with the lithium battery which can be the reason of an uncontained failure. Another significant issue is that drones can be used by terrorists. They equip drones with explosives and may use them to explode bombs. A number of airlines are greatly concerned about this issue. 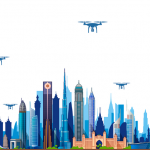 Their association IATA reports that in current times, more and more RPA are flying too close to airports or airplanes. Besides, the airlines absorb losses. Except for causing the delays at the airport, drones flying too close to airports are the main reason financial losses. Can Drones Cause Really Big Problems? The data analyses made by Airprox Board (the organization which monitors incidents related to drones) proved that the problem is really very serious. During the last 4 years, the number of incidents increased from 5 to 29. Five of the issues were critical, drones almost collided with aircrafts. It seems like some drone pilots fly very close to airports willing to make unique images of aircrafts. The majority of drone pilots understand that they need to fly responsibly, while there are some of them who do not understand what disaster they can cause flying near planes. According to the law, published in the Air Navigation Order 2009, any person who owns a drone shouldn’t lose the sight of a drone while flying. This person should monitor the drone flight and see whether the aircraft successfully avoids collisions. Besides, it is not allowed to fly near airports. How to reduce the threat? The first rule, which should be taken into consideration, is that drones must stay away from the airports and airfields. It is not allowed to fly higher than 400 feet. Besides, each user should register his drone. In the majority of countries, each person who owns the drone with the weight more than 250 gr. should register it. For instance, the US government took a decision to track and destroy drones that pose a threat to people. Drones can also be fitted with transponders that can easily transmit data. The policemen can use this information with the aim to trace offenders. DJI, the leading drone manufacturer, developed a geofencing system – a special electronic barrier, which doesn’t allow the drone to fly where it is not allowed to do this. Unfortunately, yes! They equip them with bombs and use as an ideal solution, allowing them to drop bombs from the sky. 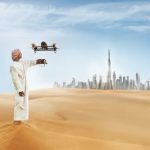 Dubai developed a good method allowing them to combat this issue. 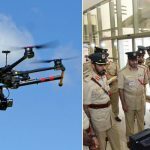 Dubai Police represented a new bomb defusing drone. The detailed information about this aircraft you can read in this article. As you see, drones can be a significant issue. Except for making aerial footage, people use them differently. Nevertheless, to avoid such issues, those people who buy drones should be responsible individuals and realize that they can cause a threat to the society.